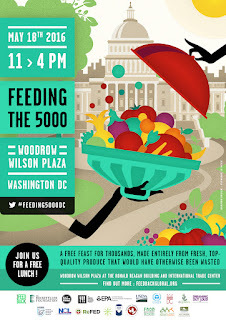 Feedback, DC Central Kitchen and Chef Spike Mendelsohn, with a coalition of partners, will host a Feeding the 5000 event in Washington, D.C. Wednesday, May 18th, 11 AM - 4 PM in Woodrow Wilson Plaza at the Ronald Reagan Building and International Trade Center. 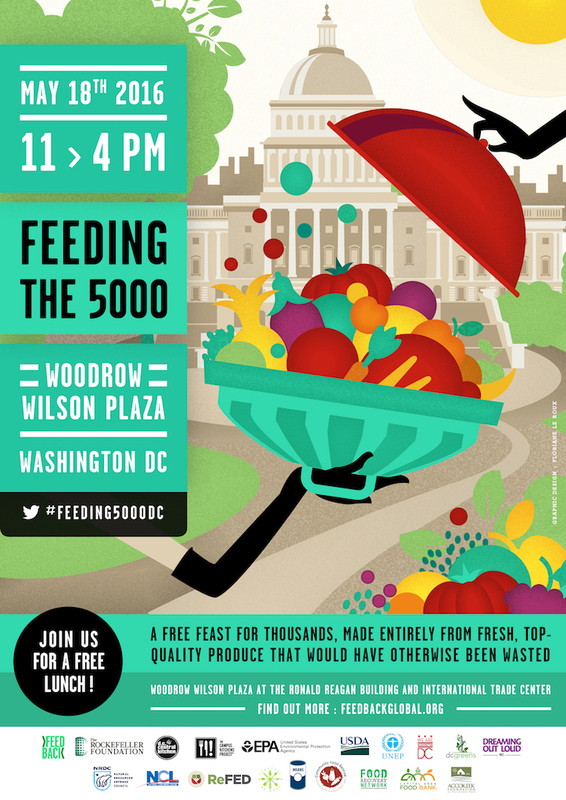 Each Feeding the 5000 event provides 5,000 members of the public with a free feast, made entirely from fresh, top-quality ingredients that would have otherwise been wasted. This meal will be procured and prepared by DC Central Kitchen, with the Chairman of DC's Food Policy Council, Chef Spike Mendelsohn; Chairman Emeritus and Culinary Ambassador for the Global Alliance for Clean Cookstoves, Chef José Andrés; and other acclaimed foodies and food policy experts lending their support to the festivities. The event is designed to educate people on how they can redefine their relationship with food waste and create change in the American food system to take food waste #OffTheMenu. Recent research has revealed that the United States spends $218 billion per year growing, processing, and transporting food that is never eaten. Up to 63 million tons of perfectly edible food end up in American landfills each year - a terrifying number from a resource and greenhouse emissions perspective, but all the more galling in light of the roughly 49 million Americans who live in food insecure households. Chef Spike Mendelsohn is the Executive Consultant for Good Stuff Eatery. The Mendelsohn family owns three restaurant concepts; Good Stuff Eatery, a landmark in the Nation’s Capital, serving handcut fries, handmade burgers and handspun shakes; We, The Pizza, an authentic pizza by the slice restaurant with old-fashioned Italian sodas and Béarnaise, a French bistro on Capitol Hill. DC Central Kitchen is America's leader in reducing hunger with recycled food, training unemployed adults for culinary careers, serving healthy school meals, and rebuilding urban food systems through social enterprise. They use food as a tool to strengthen bodies, empower minds, and build communities. Feedback, based in London, is an environmental non-profit organization dedicated to ending food waste at every level of the food system. Feedback works to shed light on the critical issue of good waste and finding tasty solutions.